To the starboard side, open gunports reveal the large mouth of a cannon preparing to fire. Just beneath is a second gunport, but this one is shut, the left door splintered from its hinge and hanging askew. The port side mirrors the starboard with its own eager cannon above, and closed gunport below, only this time a skeletal hand emerges from the door as if death itself were about to spring forth. The bow, as should surprise none, features a large grinning skull, his teeth gritted in fury and amusement at once – or perhaps it’s just a bloodlust. He sports an eyepatch and wears a captain’s hat, ostrich plumes cascading down to his cheekbone. This maniacal skull is naturally flanked by twin crossed cutlasses, their grips rough and aged, but their blades gleaming. Behind it all is a backdrop of oaken planks, their dark grain in stark contrast to the silvery jolly roger that glares up at you. And last, to the stern, are an assortment of letters, reading simply “YeOldeTattooShoppe.com”. Pirate jewelry is quite the tricky thing – nothing completes a look better, but also nothing is harder to find than that perfect little item for the right pirate. 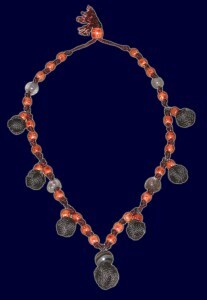 If you’re wanting jewelry that’s overtly piratey – meaning skulls, crossbones, and whatnot – this can get trickier still. It’s a fine line between pirate, goth, and biker, and finding that proper death head that says “yarrr” is no small feat. This is where Mad Jack’s comes into play rather nicely – his sterling pendants have those nice little touches that make for a proper swashbuckling look. Ghost Pirate Ship.net has deftly foiled all these pitfalls with its sterling pirate ring. Featuring a large, robust skull, this ring is anything but dainty. And its eyepatch/bandana clearly mark this as a pirate accessory, while still dodging the “yet another jolly roger” trap. But more importantly, this is a ring with personality. The skull – with its partially open jaw, and equally open eye, nostrils, and temples – appears at once spectral yet material. Its highly 3-D structure is striking, yet clings closely to the finger enough to remain entirely comfortable. This is an excellent pirate accessory. It’s sturdy, unique, and should fit right at home with any pirate outfit – be it period, fantasy, or modern. For any pirate looking to enhance their look with a piece of definitively nautical jewelry, Ghost Pirate Ship offers two tallship pendants that would be equally at home around the neck of buccaneer or law abiding merchant alike. “Privateer” and “Ghost Pirate Ship” are both large sterling pendants, each over an inch and a half in height. Both are rugged, and feature a fixed loop on the back for affixing to a strap or chain. But aside from their definiteve similarities, each ship also boasts one striking difference. 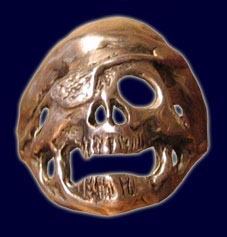 Yo yo ho – pirate bling is in the house! 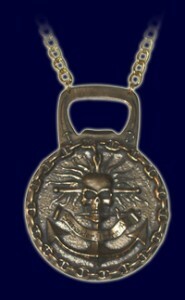 Marcus Cove Creations has made a piece of pirate jewelry that’s fun, functional, and HUGE. This highly detailed medallion features a wild-haired skull clutching a dagger in its teeth while being impaled on an anchor. Across the face is a scroll reading “Surrender Thyne Ale.” Far from a simple 2-D image, this medallion is engraved with exceptional three dimensional details and textures. The top is designed to work as a bottle opener, so your throat should never be dry. The obverse side is a less detailed, but perfectly attractive, engraving of the western half of Hispaniola – in short, Haiti and Tortuga. 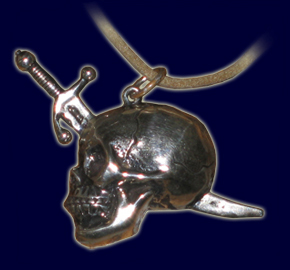 For any pirates wanting to accessorize with jewelry that differs from the typical jolly roger motif – while still remaining perfectly grim and swashbuckling – Celtic Jackalope has developed its Three Skull Pendant. 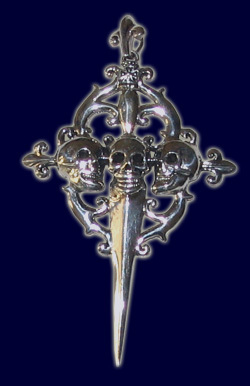 This sterling pendant features three grinning skulls atop the backdrop of a filagree-laden sword. Three fleur-de-lis surround the borders, accompanied by an iron-cross(ish) engraving just near the bezel. Nearly three inches tall, this is a commanding piece of swag that’s sure to garner many admiring comments. Consistent with Celtic Jackalope’s usual attention to detail, the back of this piece is nearly as detailed as the front, clearly showing the backs of the skulls, sword, and all other features. Despite the many tiny “appendages,” this casting is very solid. Each component is plenty robust to maintain its structural integrity, even if it gets roughed up a bit while you’re out skewering Spaniards. A very gorgeous pendant. I think it will look particularly brilliant after it ages and tarnishes a bit for that proper piratey “weathered” effect. 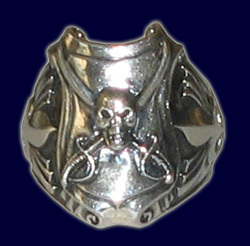 Continuing on the fine tradition of its “Dean Men Tell No Tales” line of pirate jewelry, in which they offer various sterling accoutrements featuring a distinctive skull and crossed sabers, Celtic Jackalope has now created its new, jumbo sized coat of arms ring. Enter Silhouttes’ hair beads. Jack Sparrow certainly wasn’t the first pirate to dangle beads from his dreads, but he’s easily the most memorable. And with one or two Silhouttes’ bead strands hanging from your head, you too can add some significant zest to your pirate ensamble. I inspected and test-drove two of these offerings, and found them surprisingly comfortable, once I got the hang of it (the trick is to clip them to a significant chunk of hair, so as to better distribute the weight.) As I’ve come to expect from Silhouttes, the materials are all of the best quality – not a single plastic bead was to be seen. Instead, each strand was a mixture of glass, metal, rock, wood, and even one that appeared to be bone. The string itself is metal wire, and while the clip is hardly period, it’s sturdy, effective, and shouldn’t be seen anyways. At the end of each strand is a coin – one from Denmark, and the other appears to be pakistani. The truly picky reenactor will note they’re a bit too well formed to be period (indeed, the Denmark coin clearly states it was minted in 1967.) But both appear quite old at a glance, and if you meet anyone critical enough to notice that they’re not “period,” you’d best throw the loper to the sharks before they cause any real trouble. A wonderfully effective, and wonderfully affordable, way to add that extra “punch” to your outfit. 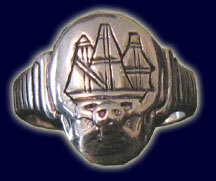 I’m pleased to once again have the opportunity to review some fine swag from Pirate Jewelry. Last time I got a peak at some neckware, and this time I can get up close with some of their finger adornments.